Angela Rovetto: Finding Happiness in Hobbies | Do-It-Yourself Advice Blog. Angela Rovetto stumbled into sewing by chance. A self-described workaholic, Angela’s schedule was plenty busy and she wasn’t looking for a hobby. But a broken patio chair was about to lead her into a joyful and unexpected new phase of her life. Angela with two of the patio chairs she made-over. A couple of years back, Angela went to relax in one of her patio sling chairs when the fabric ripped. A gift from her parents, the patio set was really nice and the frames were still in good condition, so she decided to look around to see if she could fix her chair instead of just replacing it. She watched Sailrite’s video and was encouraged by how detailed the steps were. She said she figured she’d give the project a try because it was cheaper than replacing the whole set. After watching the video “like a hundred times,” Angela set out and completed her patio set. “I felt such a sense of accomplishment, like, I did this,” she recalled. After the slings chairs were complete, Angela had fabric leftover. Not wanting to waste it, she came back to Sailrite to look for another project she could sew. She found the market tote bag tutorial. Two different bag designs Angela made. She started sewing purses and then wallets for herself and her friends. Then she made drawstring backpacks for all the children in her life. Along the way, Angela also reupholstered a chair. She described the inspiration to try upholstery as being similar to the patio chairs that started it all. The more Angela sewed the more she wanted to learn. She recalls spending a lot of time on Google, looking up new sewing techniques to help her perfect her projects. She couldn’t always find tutorials for exactly the project she wanted to make, so she’d piece the instructions together from multiple sources. In late 2015, this lead Angela to want to start her own blog as a way to share the projects she’d made with others and to “be a part of the conversation,” she said. “I just started it to see what happened,” Angela said about her blog, which has already received hits from around the world including Germany, Portugal and India. But perhaps one of the most unexpected perks of taking up sewing for Angela has been her renewed happiness and a better work/life balance. Angela made these outdoor cinder block benches and the cushions. Since learning how to sew, Angela has been a prolific maker, filling her blog with all of her creations but when she thinks back to what she’s most proud of she goes right back to the beginning. 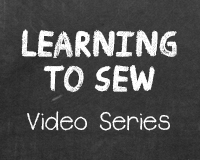 Since sewing has made such a profound impact on her life, Angela is very encouraging of others taking up sewing. Angela admitted that she doesn’t sew as much during the summer months, opting instead to spend time outdoors and on her boat. She’s currently working up the courage to reupholster the seats on her Sea Ray powerboat. Her next big project will be altering a bridesmaid dress for a wedding she’s standing up in at the end of the summer. Angela will be hemming the dress and her aunt, a seamstress, will help teach her how to alter the bodice, she said. To see more of Angela’s projects, follow her blog, Angela Sews or visit her page on Facebook. Welcome to the Sailrite blog! We’re a bunch of DIY-ers who are passionate about all things DIY. Here at the Do-It-Yourself Advice Blog, you’ll find instructions, inspiration, helpful advice, cool tools, and the more technical side to all things DIY for your home and boat. Has she or anyone else had any experience sewing leather? I would like to make an outfit, pants, shirt and jacket out of deer hides. I can’t speak for Angela, but we do have customers who have used their Ultrafeed sewing machines to sew leather. Any other readers have experience with this? I have used my Ultrafeed machine to alter and create many leather garments. In my experience, it takes careful planning. I like to go through the entire construction mentally, before I do it physically, to help find any problems beforehand. You don’t want to have to rip any seams out, because those holes will always be there. For the same reason, I do not use pins to hold pieces together. Instead, I use Wonder Clips, and heavy plastic clips originally intended to be used to fit wedding dresses. They work well, and don’t mar the leather. I use specialty leather needles in my machine when I work with leather, which gives a neater stitch, and is well worth the price. You can use a special tape or glue to hold your seam allowances down inside the garment. I prefer to press the seams to one side and stitch them in place, when I can. It’s not always the right thing to do with every seam, because it will be visible top-stitching. When it is viable, though, it gives extra strength to your seams, and is well worth doing. Good luck with your project. Working with leather isn’t as scary as it can seem beforehand, and I find it an enjoyable and rewarding medium. I can speak for Angela! I have not worked with real leather, but I have worked with pleather. In principle I think it’s similar, but the few things I’ve learned are choosing the right (heavier) needle, using a Teflon foot (nonstick) if what you’re using is “shiny,” and get it right the first time because puncture holes from the needle are there to stay…not a forgiving material!